If there is an unknown super-villain in the world of dental disease, it might be gum disease. It lurks in every mouth, is often difficult to detect, and can do enormous damage. How can we fight this villain? As usual in dental health, prevention is key. Gum disease is one of the world’s most common health problems and has links to a variety of chronic health problems including diabetes, stroke, arthritis, dementia, cancer, and heart disease. The first stage of gum disease is called gingivitis, and the good news is that you can avoid it by daily brushing and flossing, and by scheduling regular visits to see Cardiff Dental. To lower the risk of gum disease, it’s important to know what causes gingivitis and how to prevent the disease’s development. With that in mind, Cardiff Dental is pleased to share with you what you need to know about gingivitis – it’s symptoms, risk factors, how to avoid it, and treatment. Tooth pain or sensitivity. As gum disease causes gums to pull away from teeth, teeth become more sensitive to hot and cold foods or drinks. Chronic bad breath. Plaque is full of bacteria that excrete nasty smelling waste products. Loose teeth or changes in the way your teeth fit when you bite down. In fact, if your teeth are at this point, it is likely that you have gone past gingivitis to the much more destructive periodontitis. Diabetes – There is a great risk for infections developing in people who have diabetes. This includes disease of the gums. When plaque is not removed adequately, it hardens into calculus, or tartar, at the base of the teeth, near the gums. Calculus can only be removed by Cardiff Dental; it cannot be removed at home. The most effective way to defeat gingivitis is to take care of your oral health with proper teeth cleaning, flossing, and regular visits to your Cardiff Dental office. A diet low in reduced sugar, caffeine, and simple carbohydrates can also slow the development of plaque build-up when an adequate oral hygiene routine is also being practised. Unlike the later stages of gum disease (periodontitis), gingivitis is easily treated, reversed, and even better prevented with proper, daily oral hygiene. Floss Properly. Don’t just run your floss between your teeth back and forth to keep your gums and teeth clean. Flossing means gently working the string just beneath the gum line where teeth are rooted, and then working trapped gunk outward. If you don’t know how to floss, ask your Cardiff Dental hygienist to demonstrate the best way to floss. They can also share specific oral care tips with you that keep your gums and teeth in tiptop shape. Use the Right Toothbrush. Use a medium-bristle (or soft) brush to gently remove plaque and bacteria without damaging tooth enamel. Brush in a rotational motion on both the front and back of your teeth to fully clean them. Brush twice a day, and after meals if possible. Use an electric toothbrush. An electric toothbrush can rapidly clean the teeth without damaging sensitive gums and soft enamel. Make sure to brush at least twice a day or after meals. 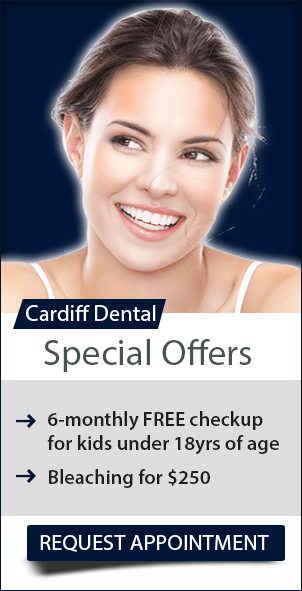 What can Cardiff Dental do? If you have gingivitis, your Cardiff Dental professional will give you a thorough cleaning to remove plaque and tartar. We may also examine your teeth and dental appliances to make sure they do not make it difficult for you to remove plaque when brushing and flossing at home. It’s critical to schedule regular follow-up appointments so we can continue to battle gum disease alongside you!